I just had to tell you about this new product that I am getting. With the Grafix Rub Onz Transfer sheets you can now create your own rub ons from your computer. I have been waiting for something like this to come out. I’m so happy its now here! From what I am understanding so far, you print out your graphic or lettering and apply an adhesive to the sheet and rub right on. They come 4- 8.5x11 sheets to a package. Ever since I got my Basic Grey rub on roller, I have been a rub on diva and now with this I don’t think anyone will be able to stop me! LOL! You know how there are those days when you are creating a card or a layout and you just don’t have a stamp that says exactly what you want it to? Or the font is all wrong for the layout? Well this should put an end to that problem. If you have used this product, please leave a comment with how you liked this product. I hope this inspires you to get out there and create! 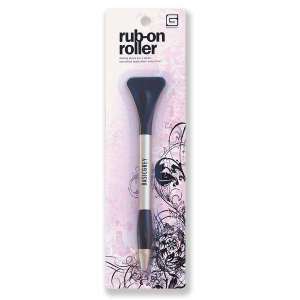 Product Review - Basic Product Review: Grey's Rub on Roller..Toss Those Popsickle Sticks! You Gotta Get This Tool! For years I have been trying just about every rub on tool out there. I never knew whether it was me or not but I always had trouble putting a nice clean rub-on down on my paper. I had just about given up on ever using rub-ons when I came across this fairly new rub on tool by Basic Grey. Its a tool that makes using and laying down rub-ons a breeze. I used it for the first time the other night with a fairly large rub on. Putting the rub on down went like lightening and didn't need the strength of a sumo wrestler! It’s shaped like a pen with a large roller ball at one end and a spatula at the other. Because the ball glides so easily you reduce the friction and you get a very clean transfer. Just lay your rub on down and trace over the word or make circular motions if it is an image. You don’t need to press down hard. The spatula end is used for setting your rub on. Lay the rub-on backing (slimy side down) over the design and burnish it with the paddle for a smooth, perfect finish. Again, you don’t need to put a lot of muscle into this step. If you buy no other tool this year buy this one. You will be so happy you did!! Currently, this retails for around $6-$7.